Kilraughts have had a jam-packed, fun and busy summer, supporting all the Young Farmers sports nights, agricultural shows and various YFCU activities and competitions. 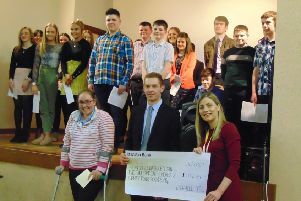 The highlights of Kilraughts YFC’s calendar included Claire Ramsay winning junior home management finals after cooking up a storm and impressing the judges with her culinary skills. Other achievements included the stock judging finals at Greenmount with Victoria Currie winning first in the beef section, Robbie McNeill was second in the sheep section and Mark McNeill was first in the silage assessment. Success was also won on the rugby field, where Kilraughts YFC juniors were crowned Northern Ireland tag rugby champions after some strenuous and tiresome matches. The main highlight for Kilraughts YFC fell on July 27th and 28th with the club’s annual sports night and summer barbecue. The sports night was held at Ballymoney Rugby Club and a great night’s fun was had playing volleyball. Kilraughts YFC were pleased at the great turnout of different junior and senior teams from various counties and it even managed to stay dry. The following evening saw the return of the club’s Hawaiian themed barbecue, where wacky shirts and sunglasses were a must. Once again cocktails went down a storm and everyone enjoyed the music provided by DJ Rocket Watson. A spokesperson for the club said: “On behalf of the club I would like to thank all members who helped out with both our sports night and barbecue. “As without your support and commitment the events woouldn’t have been the success they turned out to be. If you would like more information please contact either Amy on 07933297281 or Hannah on 07762786500 or visit Kilraughts YFC’s Facebook page to see what the club get up to.